After a full day of chasing traffic through Toronto, my cousin practically forced us to make one last stop on the way home. And it was totally worth it. In the middle of scattered dull two/three story listless buildings, sat this wonder. The organization BAPS has a temple in almost every major city in the North America but there are only a few that is so architecturally interesting. 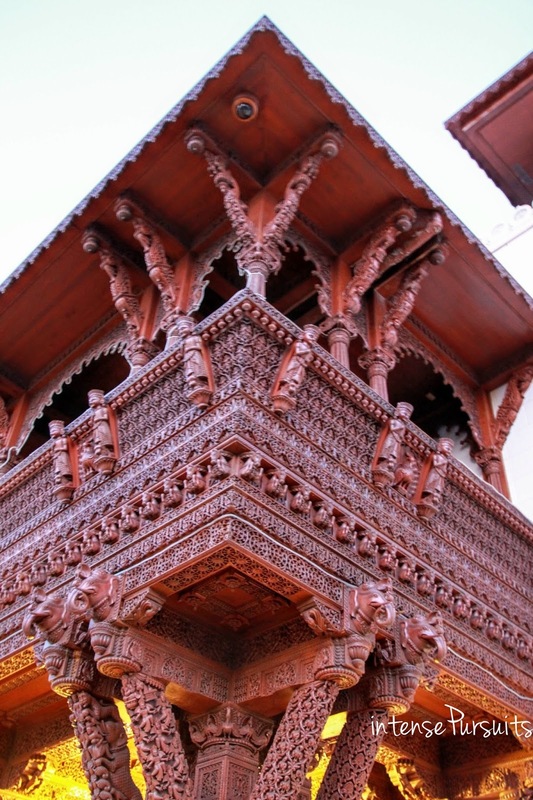 This particular one houses a Stone Mandir or Temple and a Wooden Haveli or Mansion. I am quoting their exact words in order to explain the two beautiful structures. When we reached the visiting hours were over and the gates were closed. But that didn't stop us from getting inside and constantly clicking the shutter but we were soon respectfully escorted outside! 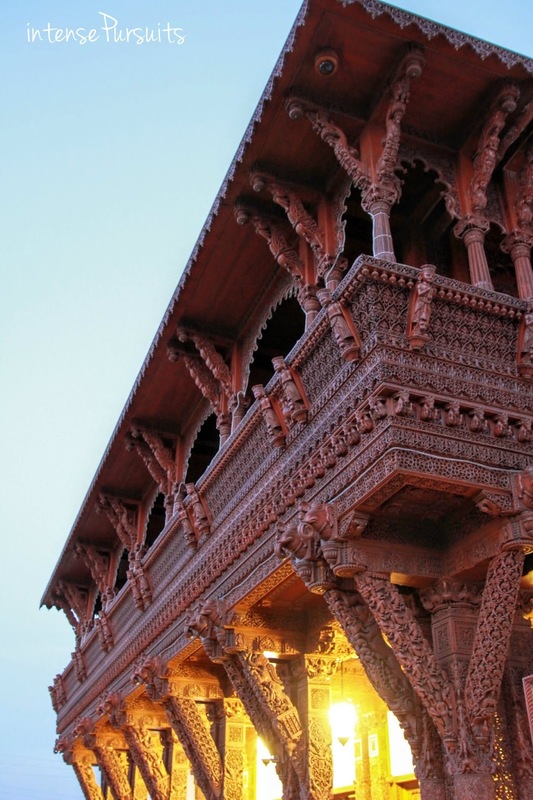 "Intricately hand-carved in Burmese teak, the Haveli reflects the traditional wooden courtyard craftsmanship of India. 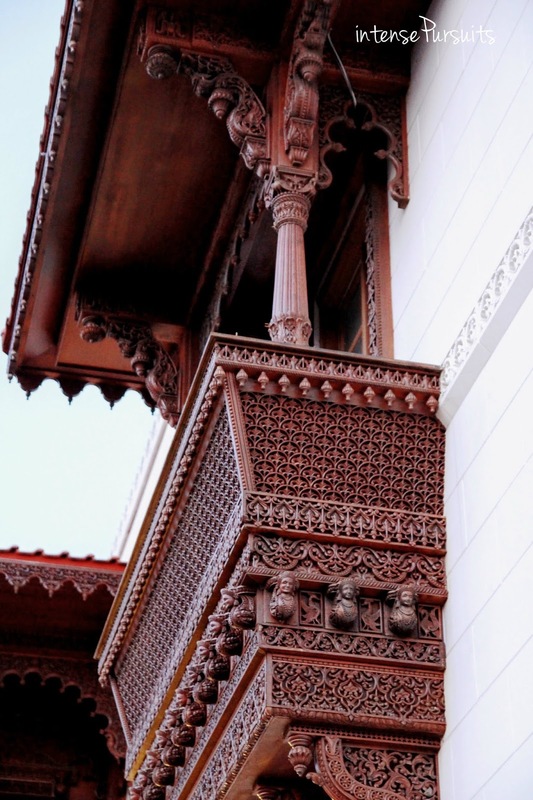 The word Haveli refers to a majestic mansion (often royal courts), which was popular in India during the 17th century." 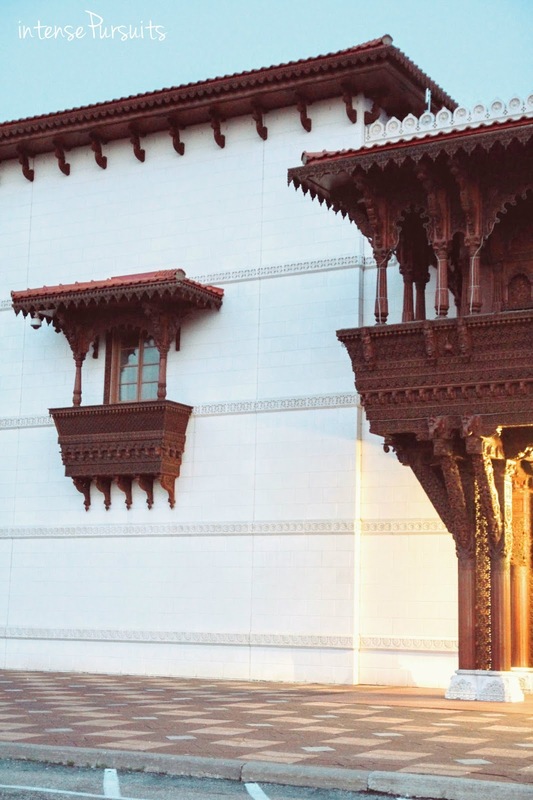 "The Haveli's beautiful architecture begins with hundreds of figures of musicians, poets, and dancers carved into the portico, welcoming all visitors in traditional Indian manner. 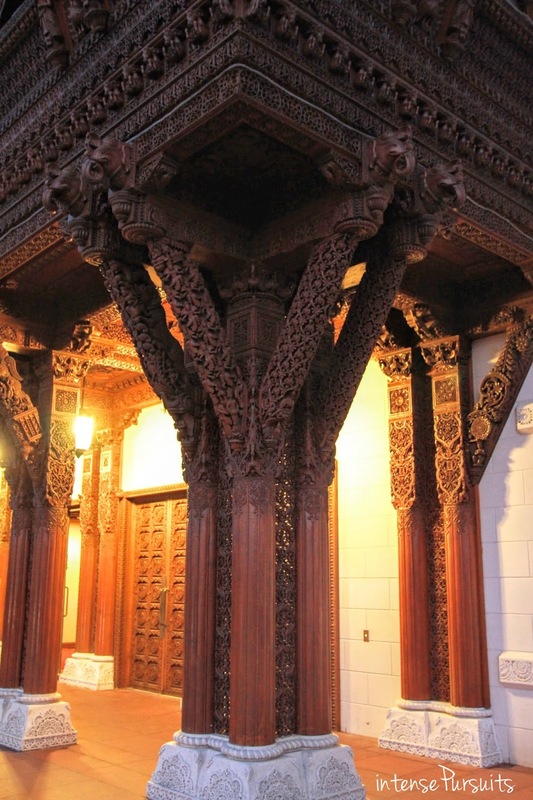 The entrance lobby features a richly hand-carved wooden foyer that opens into a magnificent courtyard with soaring wooden columns and panels." 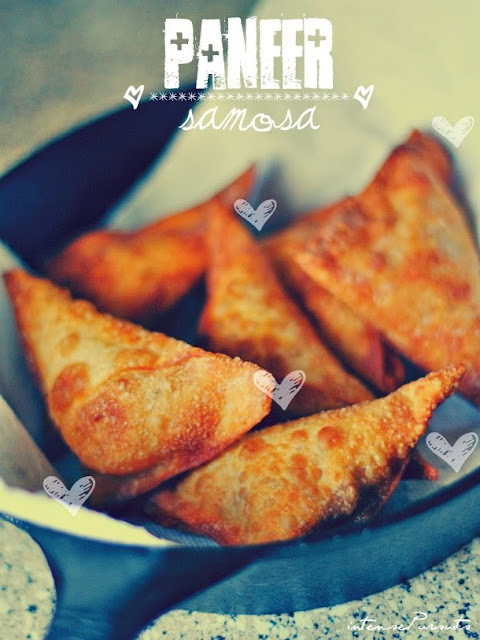 "Hundreds of dancing peacocks, delicate lotus flowers and royal elephants beckon in greeting. The carpets are uniquely designed to complement the carvings." 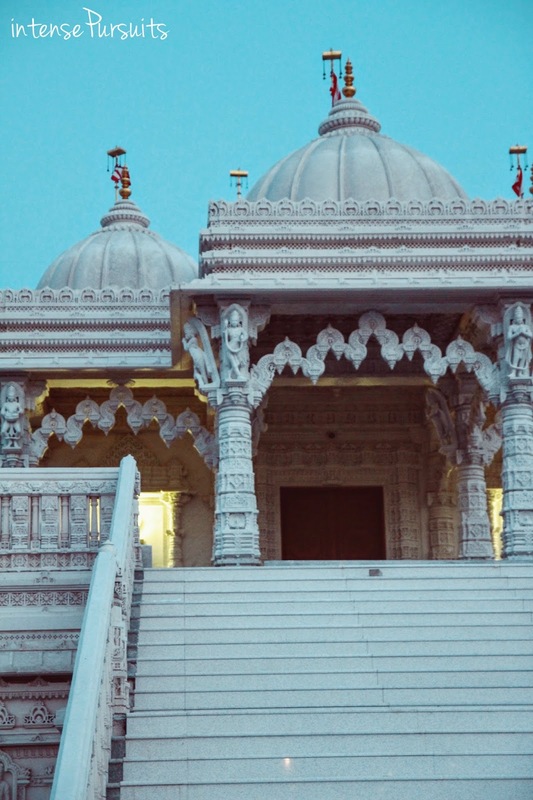 "The building serves as a place of worship for the Hindu community and a place of inspiration for all visitors. " 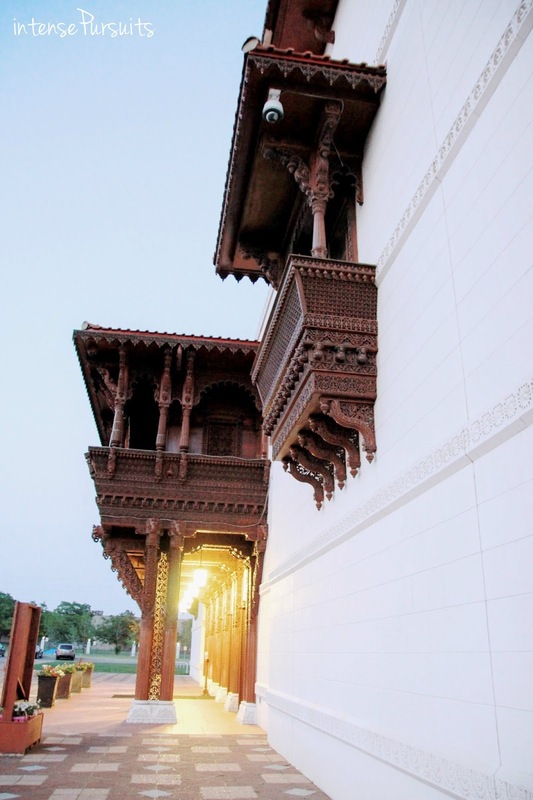 "The Haveli is an architectural masterpiece with breathtaking intricacy not previously seen in Canada." If you look closely in this shot you can notice the animals and deities that have been carved into the wood. The sun was setting when we reached and I feel like it added a layer of gorgeous pale orange to the already beautifully ivory surfaces. 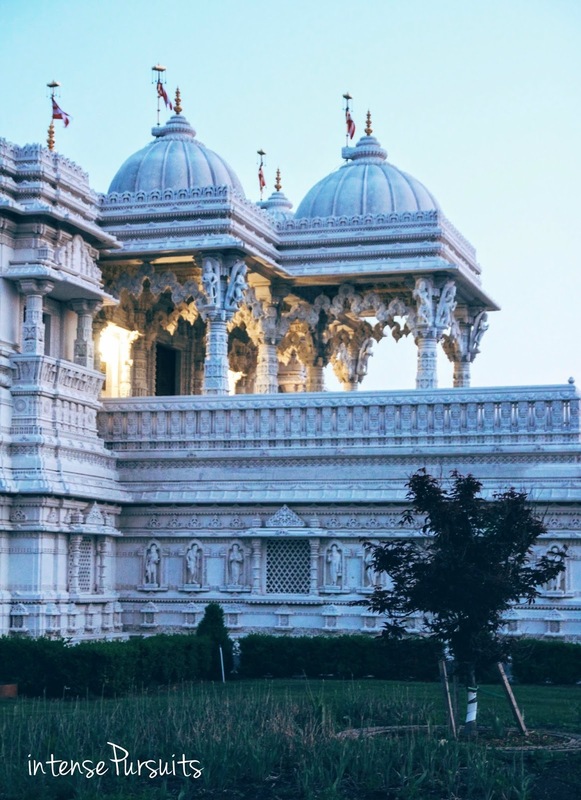 "The BAPS Shri Swaminarayan Mandir is Canada's first traditionally hand carved stone and marble Mandir built according to the principles of an ancient Indian Shilpashartras, in an extraordinary tradition that dates back many millennia." "All the masonry of a Hindu Mandir is in itself load bearing, with no reinforcement from ferrous material such as steel, even in the foundations!" "Thousands of tons of fine marble and limestone have been hand-carved by skilled craftsmen." 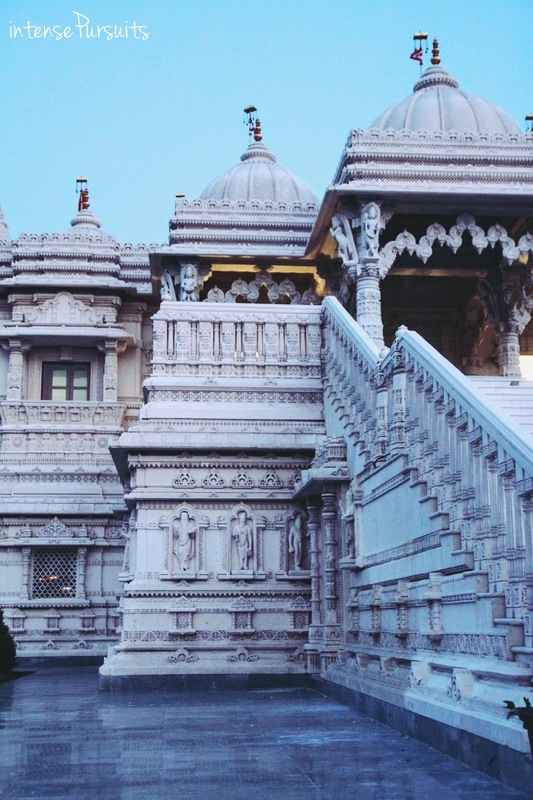 "The five ornate shrines, which are the focal point of the Mandir, houses the Murti (Sacred Deities), replete with beautiful thrones." 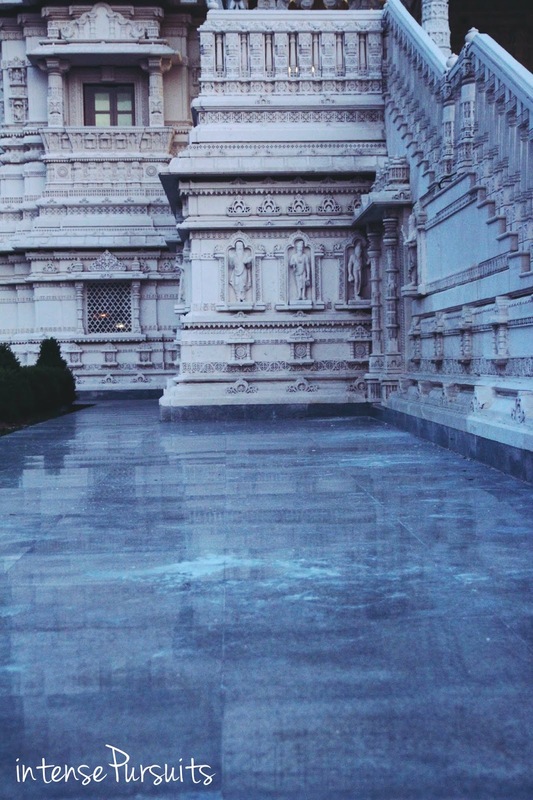 "The Mandir is a Meditation Zone, thus all visitors are required to maintain utmost silence." "Visitors can witness the Arti rituals (devotional prayer offered to God) that take place inside the Mandir. The Devotional Ceremony lasts about 15 minutes. There are separate seating arrangements inside the main Mandir for males and females during the ritual." All the quoted information about the temple is taken from here.